This warm weather certainly isn&apos;t putting us in the Christmas spirit, but holiday parties sure are! 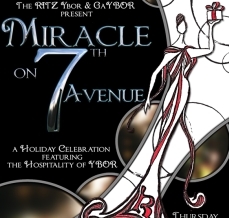 The GaYBOR District Coalition and The Ritz Ybor are hosting a holiday party, Miracle on 7th Avenue, on Thursday, December 17th, from 6-10pm at the fabulous Ritz in Ybor City. The Ritz has undergone a $2 million renovation and has been beautifully restored in the recent year. If you haven&apos;t been in the historic building in quite some time, be sure to check out this amazing venue, which has over 17,000 sq. ft. of space. Great venue for hosting private events, fundraisers, and concerts. There will be live entertainment, fashion, complimentary cocktails and hors d&apos;oeuvres. A good time to be had by all! If you&apos;re able to make it, jingle a reply to RSVP@Theritzybor.com. EVERYONE IS WELCOME! The more, the merrier. There&apos;s always something going on in Ybor City so stay tuned for more upcoming Tampa Bay area events.